Lord North was stunned by news of the Boston Tea Party. As he saw it, he had tried to help the colonists by sending them cheap tea. And what did they do? They threw it in the sea! This time they had gone too far. King George agreed. To him, the issue was no longer about taxes. It was about Great Britain’s control over the colonies. “We must master them totally,” he declared, “or leave them to themselves.” The king wasn’t about to leave the colonies to themselves, however. Great Britain’s anger led Parliament to pass a new series of laws in 1774. These laws were so harsh that many colonists called them intolerable, or unacceptable. Throughout the colonies, they became known as the Intolerable Acts. Parliament Punishes Massachusetts The Intolerable Acts were designed to punish Massachusetts for the Boston Tea Party. The first law closed Boston Harbor to all shipping until the ruined tea was paid for. The second law placed the government of Massachusetts firmly under British control. Colonists in Massachusetts could not even hold a town meeting without the colonial governor’s permission. The third law said that British soldiers who were accused of murder would be tried in England, not in the colonies. Finally, more troops were sent to Boston to enforce the new laws. A few British leaders worried that the Intolerable Acts might push the colonies into rebellion. But George III was sure they would force the colonists to give in to British authority. The Colonies Begin to Unite In fact, the Intolerable Acts did not force the colonists to give in. Boston Patriots declared they would “abandon their city to flames” before paying a penny for the lost tea. Merchants in other cities showed their support by closing their shops. 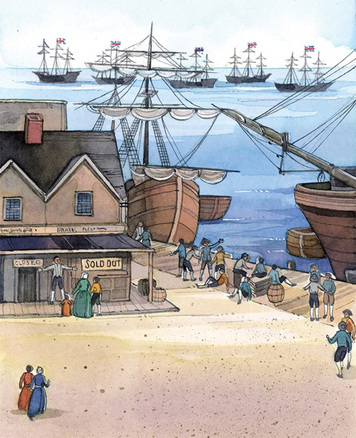 Many colonies sent food and money to Boston so that its citizens would not starve. The Virginians also called for a congress, or meeting, of delegates from all the colonies. The purpose of the congress would be to find a peaceful solution to the conflicts with Great Britain. Not all Americans agreed with this plan. In every colony, there were Loyalists who thought that Bostonians had gone too far and should pay for the tea. If they were forced to choose, they would side with the king against Sam Adams and his Sons of Liberty. In their view, it was the misguided Patriots who were causing all the trouble. The First Continental Congress In September 1774, some 50 leaders from 12 colonies met in Philadelphia. The meeting brought together delegates from most of the British colonies on the North American continent, so it was called the First Continental Congress. The delegates were used to thinking of themselves as citizens of their own colonies. Patrick Henry, a leader from Virginia, urged them to come together as one people. “I am not a Virginian,” he declared, “but an American.” But only strong Patriots like Sam and John Adams were ready to think of themselves this way. Many delegates were strong Loyalists who still thought of themselves as British. Still others, like George Washington, were somewhere in between. Only one thing united the delegates—their love of liberty and hatred of tyranny. In spite of their differences, the delegates agreed to send a respectful message to King George. The message urged the king to consider their complaints and to recognize their rights. The delegates also called for a new boycott of British goods until Parliament repealed the Intolerable Acts. Finally, they agreed to meet again the following May if the boycott didn’t work. The Colonies Form Militias In towns and cities throughout the colonies, Patriots appointed committees to enforce the boycott. In case the boycott didn’t work, they also organized local militias. In New England, the volunteers called themselves Minutemen because they could be ready to fight in 60 seconds. Across the colonies, militias marched and drilled. In New Hampshire, unknown persons stole 100 barrels of gunpowder and 16 cannons from a British fort. Similar thefts occurred in other colonies. Rather than forcing the colonies to give in, the Intolerable Acts had brought the two sides to the brink of war. King George had made many mistakes in his decisions about the colonies. The First Continental Congress listed all these mistakes in its message to the king. Now he made another one. Rather than consider the colonists’ complaints, King George refused even to answer their message. “The New England governments are in a state of rebellion,” he said. “Blows must decide whether they are to be subject to this country or independent.” In Boston, General Gage, the king’s commander of British troops in America, got ready to deliver those blows. The First Blow at Lexington In April 1775, a spy told General Gage that the colonists were hiding a large supply of gunpowder and weapons in the nearby village of Concord. General Gage decided to strike at once. The general ordered 700 of his best troops to march to Concord and seize the weapons. To keep the colonists from moving the weapons, the attack had to be a surprise. So Gage had his troops march the 20 miles to Concord at night. The colonists had their own spies. When Gage’s troops slipped out of Boston on April 18, 1775, Patriots were watching their every move. Soon Paul Revere and others were galloping through the countryside, warning colonists that the British soldiers were coming. The news reached Lexington, a town on the road to Concord, in the early hours of April 19. Led by Captain John Parker, a small band of Minutemen gathered nervously in the chilly night air. At dawn, the British troops reached the town green. “Stand your ground,” ordered Parker. “Don’t fire unless fired upon, but if they mean to have a war, let it begin here.” As the Minuteman faced the British troops, a shot rang out—from where, no one knew for certain. Without orders, the soldiers rushed forward, shooting wildly. A few Minutemen managed to return fire. When the firing stopped, eight colonists lay dead or dying. Another ten were limping to safety with painful wounds. The British troops gave three cheers for victory and marched on to Concord. The Second Blow at Concord By breakfast time, the British were in Concord, searching for gunpowder and weapons. But the colonists had hidden them. In frustration, the soldiers piled up a few wooden tools, tents, and gun carriages and set them on fire. On a ridge outside the city, militiamen from the surrounding countryside watched the smoke rise. “Will you let them burn the town down?” shouted one man. Captain Isaac Davis replied, “I haven’t a man that’s afraid to go.” Davis marched his volunteers down the hill. 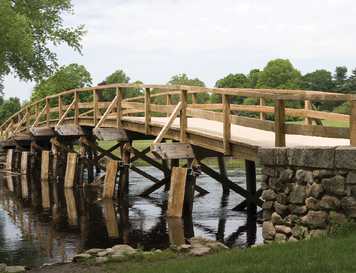 As they approached Concord’s North Bridge, the British troops opened fire. Davis fell dead, a bullet through his heart. The British expected the Americans to break and run. To their surprise, the Minutemen stood their ground and fired back. Two minutes later, it was the redcoats who were running away in panic. Indeed, since the French and Indian War, the British had been mistaken about the colonists again and again. Their biggest mistake was in thinking that ordinary people—farmers, merchants, workers, and housewives—would not fight for the rights that they held dear. At Lexington and Concord, Americans proved they were not only willing to fight for their rights. They were even willing to die for them.